Back in May I accompanied Taylor Wilson (who has more photos on his website) and his father on a little radioactive scavenger hunt in Bayo Canyon. Access is via the dirt road (“Pueblo Canyon Road”) leading to the Los Alamos Sewage Treatment Plant. (Caution visitors…this road is gated and may be closed. Enter at your own risk!) On this day we were armed only with scintillation detectors, unfortunately a poor choice for hunting the pure beta-emitting Sr-90 that constitutes most of the remnant contamination. 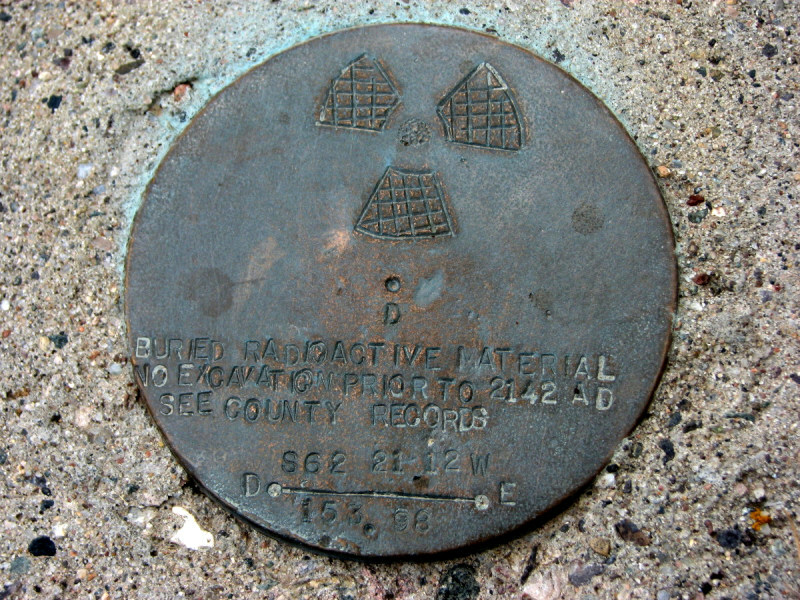 The area around the former radiochemical building (TA-10-1) site is well-marked though, with a combination of chain-link fence, roped-off areas, and little markers as shown in the top photo. We did detect a few above-background areas with the scintillometers, but nothing to get too excited about. Next time, I’ll take a pancake GM detector! 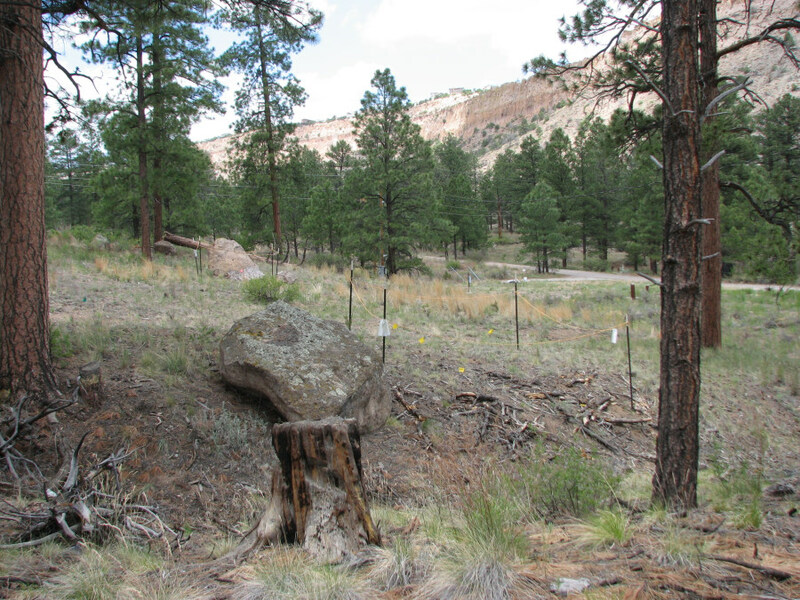 Bayo Canyon is a great place for a quiet day hike and picnic near Los Alamos, with some interesting history for the nuclear tourist to boot. Where else on earth can you picnic on dirty-bombed ground? Carl,I am not an expert on ion plasma propulsion for spacecraft, but if we were to begin building a spacecraft for a manned mission to Mars,right now, today, it would incorporate but conventional rockets and ion plasma propulsion. How far along is the VASIMR? I really prefer a non-cryogenic fuel, preferably a solid, or at least found naturally in a solid state. What do you think of using Radium? Dan P.S. Much of our CYRUS SPACE SYSTEM has been incorporated into the Augustine report. Not sure I can help, as your inquiry relates to a technology outside my areas of expertise. So with regard to VASIMR, I could only suggest that you contact someone actively involved. My own (very tangential) connection to space propulsion is limited to some contacts in the Farnsworth fusor community who think that device is potentially useful as an engine. And a little bit of classwork: as a design class project in OSU’s nuclear engineering program, I studied what I called “direct nuclear propulsion,” i.e. exploiting the momentum of fission fragments produced in a fissile “thrust foil” that was parasitic on a powerful fast reactor core. I designed the reactor and some other students studied the specific impulse, the thermal system, shielding, and other aspects of the design. This was during the days when JIMO was still on the table and would have likely carried a nuclear-electric power plant. The idea of “direct nuclear propulsion” is nominally pretty silly, but made an entertaining and original academic class project. Good luck with your work, sounds like fun. they imploded radioactive lanthanum-after the explosion they would scoop up the immediate blast profile,at 20 meters at most.WHY? 1.the lame excuse-trying to get an oval shaped pit to implode spherically(as in an attempt to get more plutonium fissioned).2-my best guess-it is necessary a ASYMMETRICAL IMPLOSION,witch will led to asymmetrical fission and a nice diffusional flow of neutrons towards the fusion stage of the h bomb. by the way,was the A bomb named after albert einsteinium?